The beautiful embellished design at the waistband of this dress reminds us of seashells and the navy and ivory color combination is a nautical ocean-inspired color scheme we love. 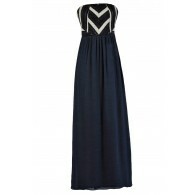 The Washed Ashore Embellished Waist Navy and Ivory High Low Dress is fully lined to the mid-thigh. It has a strapless sweetheart neckline. The top is made of ivory chiffon and has a crossover fabric design. The empire waistband is decorated with seed beads in an intricate pattern, adding sparkle to this look. The attached skirt has a dramatic high low cut. A hidden back zipper completes this dress. The Washed Ashore Embellished Waist Navy and Ivory High Low Dress would look nice paired with pumps or strappy heels and a clutch. 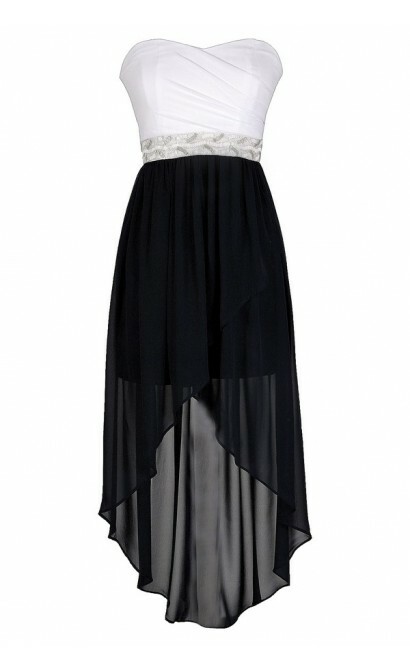 This is a great semi-formal dress to wear to your next party or dance. Details: Fully lined to mid-thigh. Hidden back zipper. 100% polyester. Lining: 95% polyester, 5% spandex. Exclusive of decoration, hand wash cold only non-chlorine bleach when needed. Line dry. Cool iron if needed. Do not dry clean. Small measurements: Length from top of bust to hemline: 27-49". Bust: 32". You have added Washed Ashore Embellished Waist Navy and Ivory High Low Dress into Wishlist. You have added Washed Ashore Embellished Waist Navy and Ivory High Low Dress for Stock Notification. 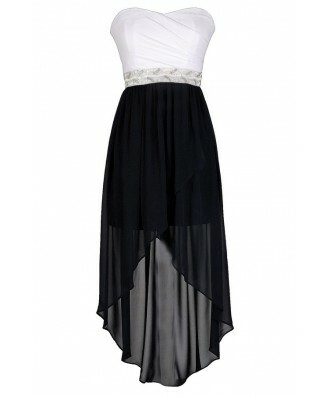 You have set Washed Ashore Embellished Waist Navy and Ivory High Low Dress as a loved product. 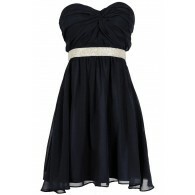 You have removed Washed Ashore Embellished Waist Navy and Ivory High Low Dress as a loved product.